Hey y’all! 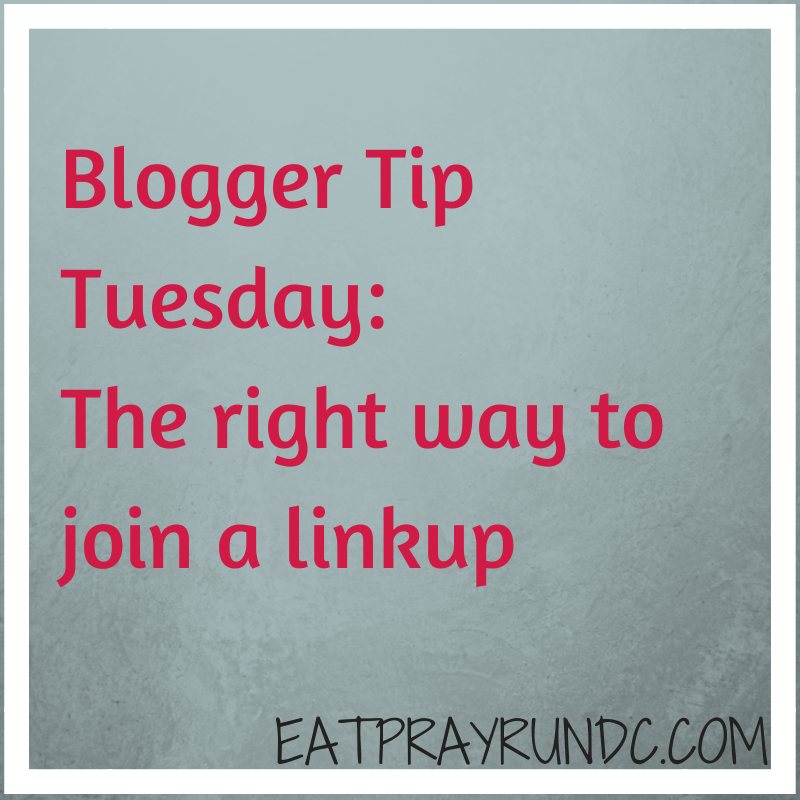 It’s another Blogger Tip Tuesday and today I wanted to lay out some concrete tips about how to join a linkup without messing it up or upsetting your linkup hosts. As most of y’all know, I co-host a weekly linkup (the Friday Five) with Cynthia and Mar. We love hosting The Friday Five and are so proud of how much the linkup has grown (we had almost 40 blogs link up last Friday!). We get a number of questions about how to linkup and linkup etiquette so I thought I’d write a more general post about how to properly join a linkup! There are many great linkups out there – I participate in a couple outside of the one I host and I always try to make sure I’m following the rules. Turn off CAPTCHA. PLEASE. I’ve talked before about how awful captcha is but when you are participating in a linkup you REALLY want to make it easy for folks to comment. Many people just won’t comment if they have to jump through hoops like captcha. Please just turn it off for the day of the linkup if you can’t bear to get rid of it forever (but seriously, get rid of it and watch the number of comments you get rise!). Since we’re talking about captcha, it’s also a good idea to disable anything you have that requires people to sign up for something to comment. Most people don’t want to do this and simply get annoyed. As a host, I like to comment on each blog linked up. But requiring me to sign up for disqus or some other thing just isn’t cool! Link back to your hosts. Not doing this is just rude. And will most likely upset your host and maybe even lead to your link being deleted. Your hosts put in the work to create the linkup — linking back to them is the least you can do! Follow the rules. For the linkup I cohost the rules are simple: link up a Friday Five post (or any other post from that Friday). However I can’t tell you the number of people who just link up to their blog, not a specific post. When it happens every week, it’s very annoying and we’ve started deleting links that do the same offenses week after week. Check out other links. Again, it’s just good manners. Don’t link up every week but never visit anyone else’s blog. What am I missing? If you host a linkup – what bugs you? Thanks for laying out all the details-I’ve really been enjoying participating in the Friday linkups. It’s great to discover new blogs to follow and yes it makes it easier to comment when you don’t have to sign up for something first. Looking forward to this week! Deborah @ Confessions of a Mother Runner recently posted…The Best Chocolate Protein Muffins! Thanks for laying the rules out very clearly. Since we can’t all read all the posts linked up on Friday (wait, bloggers have lives outside of blogging? ), its so important that the link be to the post itself and not just to the blog homepage. If I have to scroll to find the post, I’m likely to not read it. YES YES YES! so important to make it easy for folks to read and comment! ugh, Captcha. I just don’t comment if you don’t have a name/URL option. I have very limited time to read and comment on blogs so it has to be easy for me to do so. yep. it continues to be SO frustrating! i agree 100% – i love getting to discover new-to-me bloggers! I despise Captcha. I will try it once then give up if it doesn’t recognize my response. Also, I hate when people link their blog url instead of the actual post url. I won’t spend long looking for the post before leaving. Thanks for hosting such a great linkup. I haven’t had many chances to participate but I love some of the bloggers I have discovered thanks to it! Keep it up! aw, thanks haley! and yes, w/captcha i’ll try once and then it’s over! Thanks for the tips. For newbies like myself it’s always good to learn the proper etiquette! I am so glad that you wrote this post. Even after you’ve posted the guidelines for your friday link ups, i’ve still seen bloggers who link up with out mentioning you or even doing a Friday 5 for that matter. I try to visit everyone who links up, sometimes I don’t get to them all till saturday, but I try. It is kind of a bummer when we are consistent in visiting the same bloggers every week and I see that they in return visit very few blogs back. Overall though it looks like your link ups have been a success! Thanks for hosting! Thanks Meranda — I agree that when folks don’t make an effort to visit other blogs it takes away some of the fun of it. So glad to have y’all linking up, though! You should link up with us this Friday! YES YES YES! I’m so glad you posted this! I’ve noticed so many times when people will not mention the hosts or will link to a post that has absolutely nothing to do with the link up. It is my #1 blogger pet peeve! May I put a link to this entry on my announcement, Courtney?